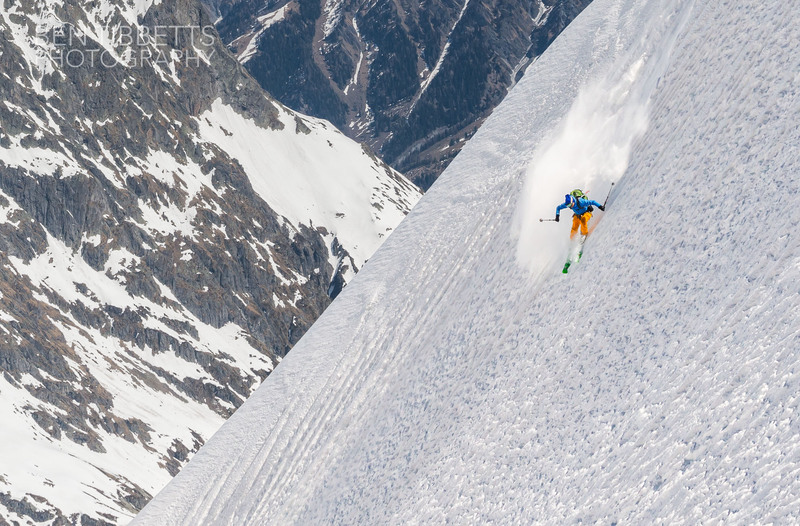 Mont Dolent (left) and the NE Face of the Aiguille de l’Amône (right – descent marked) from near Grand Lui. The Mont Dolent is in the far corner of the glacier, and just to its left is a smaller peak, the Amône, which looks rather insignificant from this side. Tom and Ross (http://rosshewitt.net) crossing the rimaye. 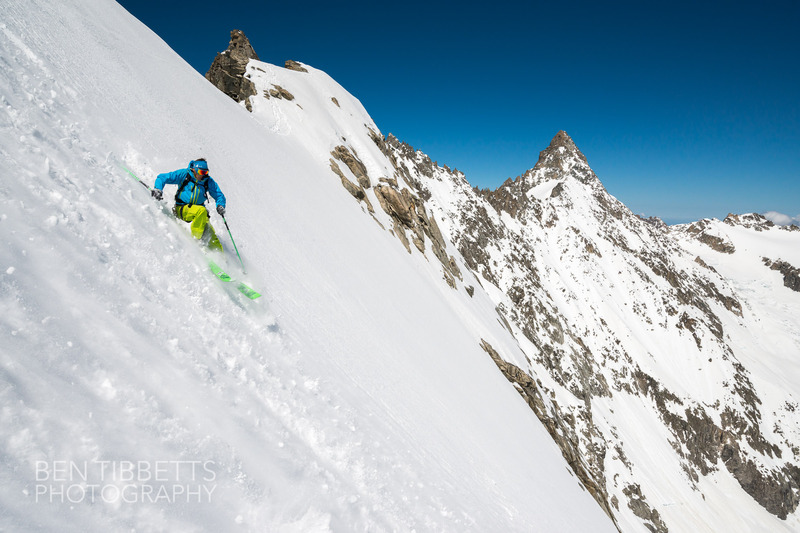 We booted up the SW couloir on firm snow to reach the col at 11.30. 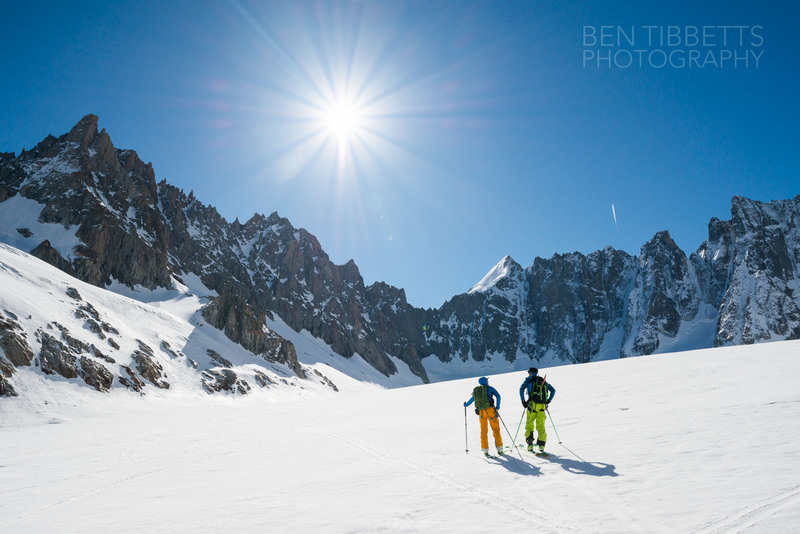 Ross and Tom in the SW couloir of the Aiguille de l’Amône. 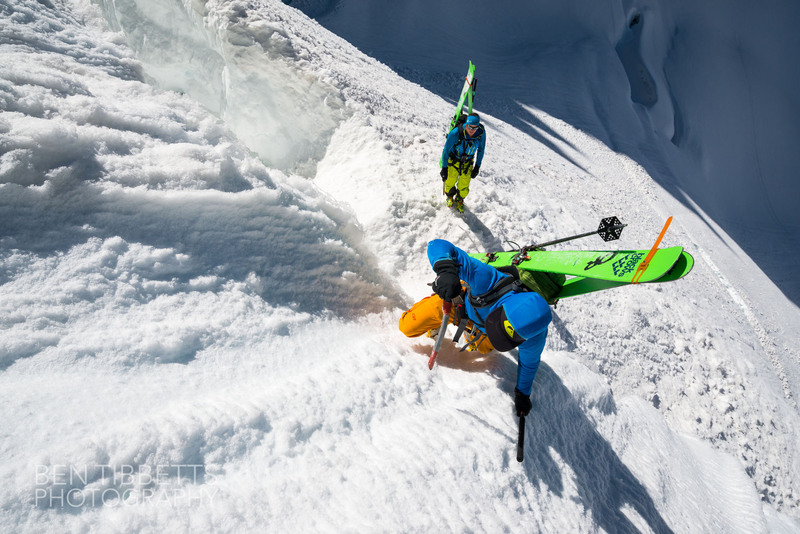 Ross had actually done this traverse before so having just brought one lightweight little axe and semi-alloy crampons to climb the couloir (AD) I was reassured to see he had just one ultralight axe on his pack. 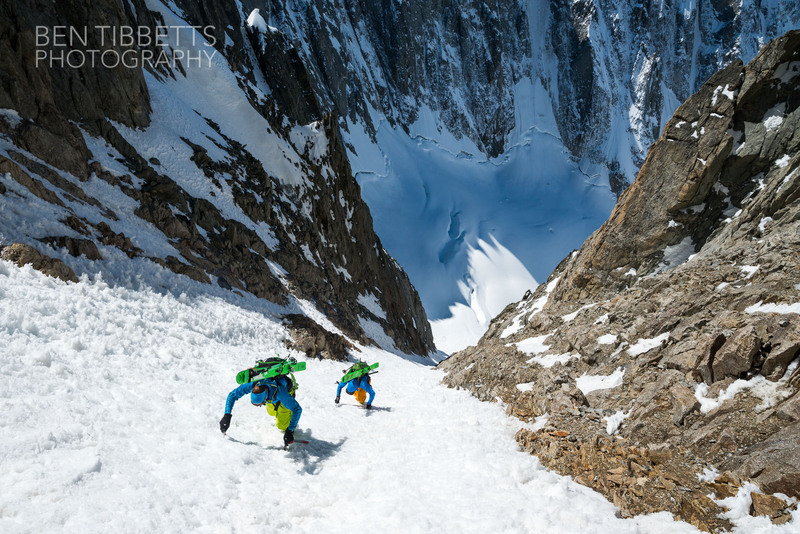 I was slightly less at ease when we changed to bootpacking at the bottom of the couloir and he brings out a second technical axe and steel clipon crampons for the little climb…! In the end conditions were good and climbing was casual. 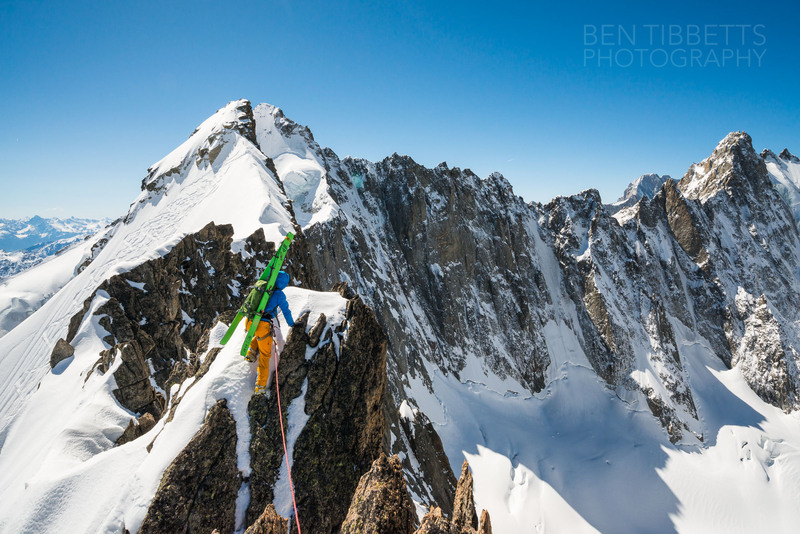 Above and below – Tom on the ridge traverse. 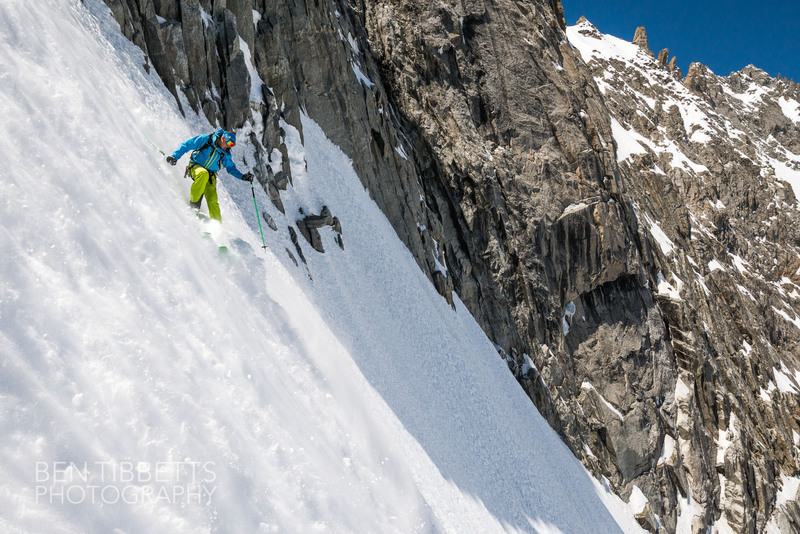 When we reached the col we found that the face had already been skied a few days earlier by some folk ascending from the Swiss side in a return trip… Still lots of snow left though it seemed! The ridge traverse was pretty fun little PD scramble, but exposed so we put a rope on. I dropped into the face first as I wanted to get photos of the guys. 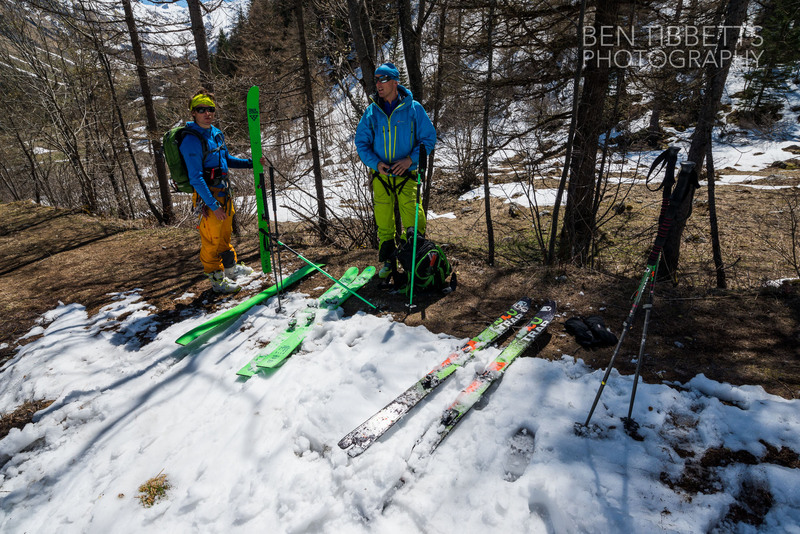 To get photos of them on fresh snow though, as so often that meant skiing tracks myself… which in this case was rather disconcerting slabby chalk on a very firm base! Tom on the skiers right of the upper face. Out to the sides of the previous tracks there was however some excellent snow and Tom and Ross skied the face in about 6 turns! 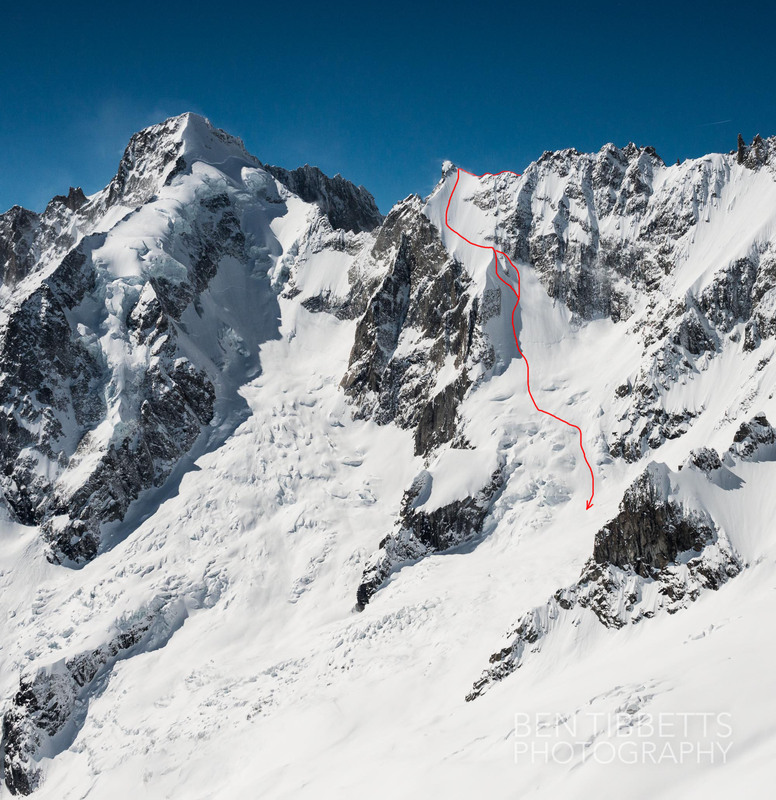 Unfortunately, as Ross had mentioned, photographing from the line itself you have no perspective on the exposure of the face, hanging over a vertical cliff of c.500m… we could be still at Grand Montets! Need to come back with a Heli!! After the hanging face we pulled hard left to the rib dividing the faces. 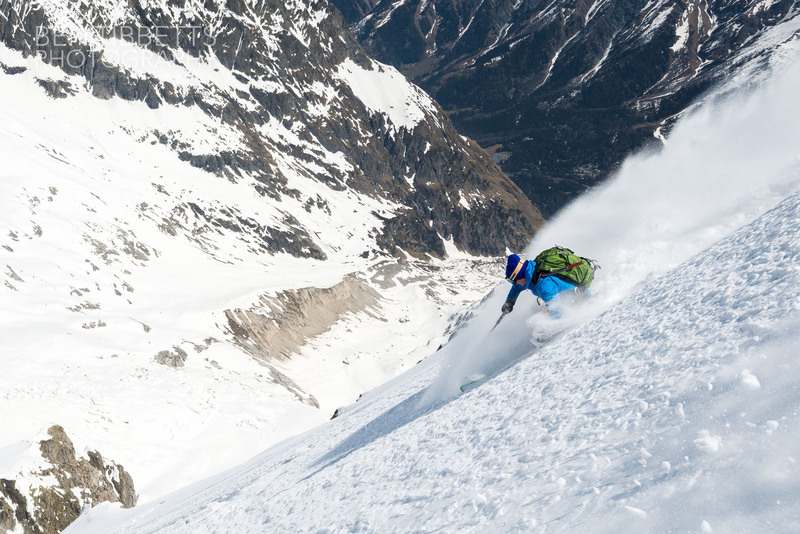 Tom went first down the rib to explore the steep face below… he slashed down it (above) and it was just a powder coating on a very hard base! 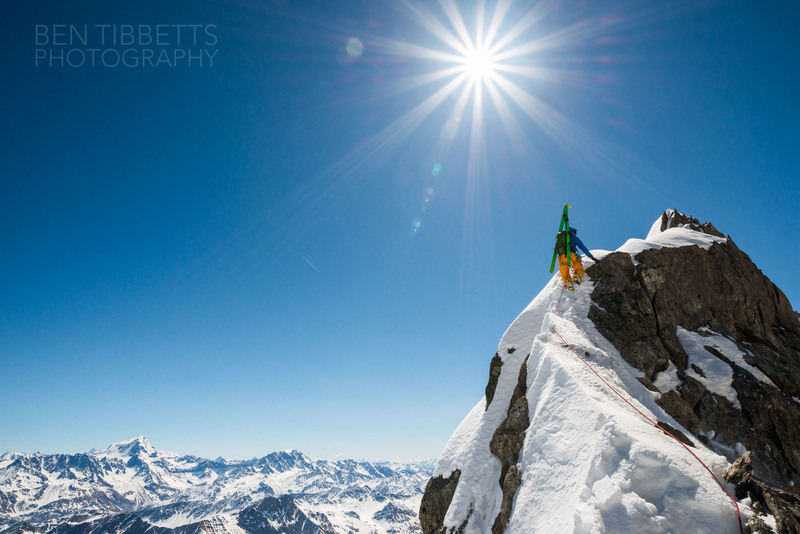 Ross went next and skied hard left into another coomb (below) which had a lot more snow, but quite variable also! The ski out through the seracs and cravasses was surprisingly ok, though the snow was cooked through by this point! 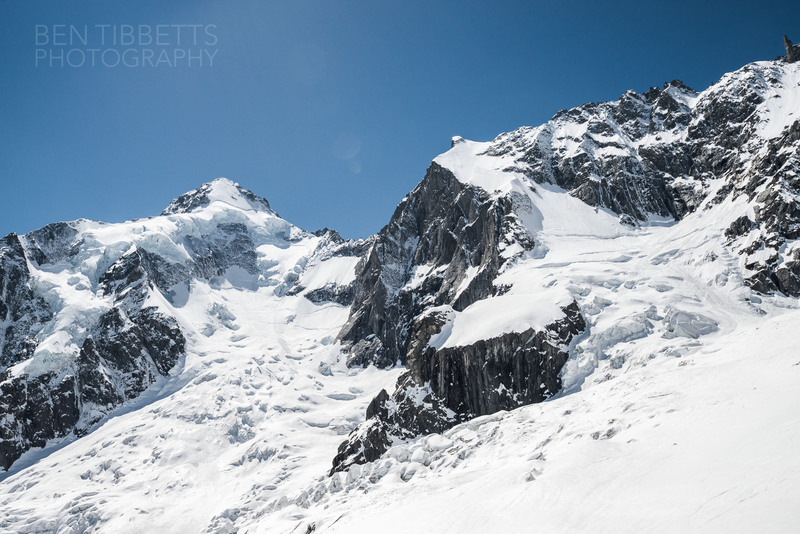 Looking back up the Amone face (right) from the glacier below + Mont Dolent to the lookers left. 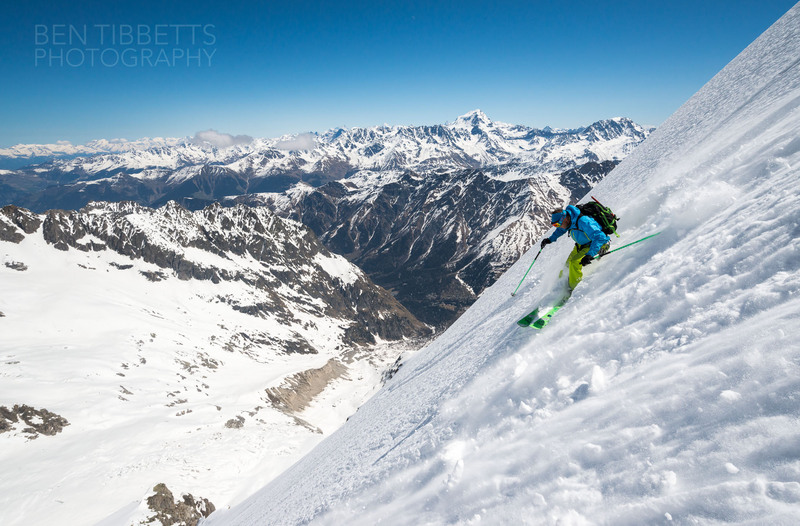 We skied nearly all the way back to the roadhead at La Fouly… great day out, thanks guys!